Promoting sustainability one to-go meal at a time. 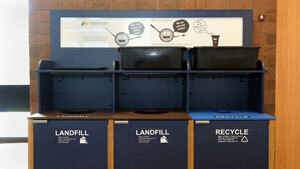 One of the ways Dining Services promotes sustainability on campus is with our "greenie" containers. Whether you want soup, salad or a hot entree, the greenie containers will accommodate all of the items available on the salad and hot bars -- without adding trash to the landfill. Then, when you're done, return your greenie containers to the recycle bins in the food court or to any food service location to be washed and put back into circulation.